Multi instrumentalist and keyboard player with rock band Dire Straits, Guy Fletcher was born May 24th 1960 in Maidstone, Kent, England. He was born into a musical family and is the namesake of his uncle, Guy Fletcher, who has written several hit songs for other artists with composing partner Doug Flett. His mother Barbara was a session singer and his father Ted Fletcher, a well established audio designer, (Orbitsound) created a line of audio equipment named after Joe Meek with whom he had worked. Whilst learning a trade as an audio engineer at DJM Studios in London Guy also had a succession of his own bands and learned to play keyboards, guitars, and a variety of stringed instruments. He joined and toured with Steve Harley’s ‘Cockney Rebel’ in 1979 and in 1981, Roxy Music for their ‘Avalon’ world tour. In 1983, Guy was recruited by Dire Straits’ lead guitarist Mark Knopfler to work on the music for the films Cal and ‘Comfort and Joy, he joined Dire Straits in 1984. The group released their first album, Dire Straits and toured with the Talking Heads. Upon it’s rerelease “Sultans of Swing” became one of Dire Straits’ biggest hits and has since become a fixture in the band’s live performances. “ The group’s second album, Communique was Released in June 1979, it Featured the singles “Lady Writer” and Once Upon a Time in the West”. Dire Straits’ fourth studio album Love Over Gold, was released in 1982 and contained lengthy, experimental passages, including Private Investigations. It went gold in America and spent four weeks at number one in the United Kingdom. “Private Investigations”, became another of the band’s most popular live songs. along with “Industrial Disease”, a song that looks at the decline of the British manufacturing industry in the early 1980s. In 1983, a four-song EP titled ExtendedancEPlay was released while Love Over Gold was still in the album charts. It featured the hit single “Twisting By the Pool”. Dire Straits also embarked on a world tour, and the resulting double album Alchemy Live, a recording of two live concerts of the group at London’s Hammersmith Odeon in July 1983, was released in March 1984. Dire Straits hugely popular album Brothers in Arms, was released in 1985 containing the tracks “Money for Nothing”, “Walk of Life”, “So Far Away”, “Your Latest Trick” and “Brothers in Arms”. It entered the UK Albums Chart at number 1 and spent a total of 228 weeks in the charts, Going on to become the best-selling album of 1985 in the UK. “Money for Nothing” was also one of the first videos ever to be played on MTV in Britain and featured guest vocals by Sting, who is credited with co-writing the song with Mark Knopfler, although in fact, it was just the inclusion of the melody line from “Don’t Stand So Close To Me”.Brothers in Arms was among the first albums recorded on digital equipment due to Knopfler pushing for improved sound quality The album’s title track is reported to be the world’s first CD single. The album is listed in the Guinness Book of World Records as the first compact disc to sell a million copies, and has been credited with helping to popularise the CD format. The Dire Straits sound drew from a variety of musical influences, including jazz, folk, blues, and came closest to beat music within the context of rock and roll. Despite the prominence of punk rock during the band’s early years, the band’s stripped-down sound contrasted with punk, demonstrating a more “rootsy” influence that emerged out of pub rock. Many of Dire Straits’ compositions have made them one of the world’s most commercially successful bands, with worldwide album sales of over 120 million. Their fifth album, Brothers in Arms, has won many accolades. In November 2009, Dire Straits were honoured by the new PRS for Music Heritage Award. A special blue plaque was erected at Farrer House, Church Street, Deptford in south London, where the original group, Mark Knopfler, David Knopfler, John Illsley and Pick Withers once shared a council flat and performed their first ever gig in 1977. PRS for Music has set up the Heritage Award to recognise the unusual “performance birthplaces” of famous bands and artists. Dire Straits have also won numerous music awards during their career, including four Grammy Awards, three Brit Awards—winning Best British Group twice, and two MTV Video Music Awards. After Dire Straits disbanded in 1995, Fletcher continued his association with former band founder, Mark Knopfler, as a core member of his band after launching his solo career. Between late February and August, 2005, Fletcher completed a world tour as his sideman, promoting Knopfler’s 2004 solo album, Shangri-La, and in 2006 rounded off the duets tour with Knopfler and Emmylou Harris. Fletcher also toured as part of Bryan Ferry´s band on his Mamouna world tour.Fletcher co-produced and played keyboards on Knopflers solo album, Get Lucky, and was again part of his subsequent world tour in 2010. Fletcher’s first solo album, Inamorata, was released on 28 January 2008. Mark Knopfler guests as lead guitarist for two tracks, and various musicians who have been associated with Knopfler’s band also make appearances.On 24 May 2010, Fletcher released his second solo album, titled Natural Selection. 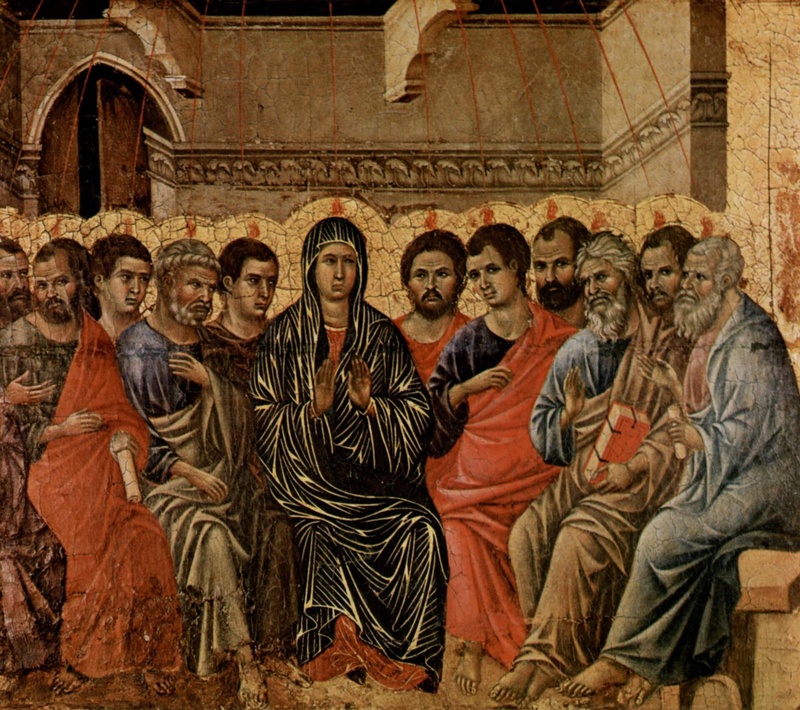 This year Pentecost is celebrated in Western Christianity on 24 May 2015 The celebrations of Pentecost in Western churches are as rich and varied as those in the East. The main sign of Pentecost in the West is the color red. It symbolizes joy and the fire of the Holy Spirit. Priests or ministers, and choirs wear red vestments, and in modern times, the custom has extended to the lay people of the congregation wearing red clothing in celebration as well. Red banners are often hung from walls or ceilings to symbolize the blowing of the “mighty wind” and the free movement of the Spirit. The celebrations may depict symbols of the Holy Spirit, such as the dove or flames, symbols of the church such as Noah’s Ark and the Pomegranate, or especially within Protestant churches of Reformed and Evangelical traditions, words rather than images naming for example, the gifts and Fruits of the Spirit. Red flowers at the altar/preaching area, and red flowering plants such as geraniums around the church are also typical decorations for Pentecost masses/services. These symbolize the renewal of life, the coming of the warmth of summer, and the growth of the church at and from the first Pentecost. In the southern hemisphere, for example, in southern Australia, Pentecost comes in the mellow autumntide, after the often great heat of summer, and the red leaves of the poinsettia have often been used to decorate churches then. These flowers often play an important role in the ancestral rites, and other rites, of the particular congregation. For example, in both Protestant and Catholic churches, the plants brought in to decorate for the holiday may be each “sponsored” by individuals in memory of a particular loved one, or in honor of a living person on a significant occasion, such as their Confirmation day.